The story of the Fallen Law Enforcement Officer plate started in 2006 with the tragic and senseless death of K9 Deputy Matthew ”Matt” Williams of the Polk County Sheriff’s Office in Florida. 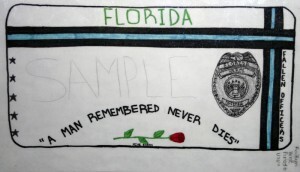 After this incident, as part of a school project, Pinellas Park High School Criminal Justice Academy teacher Richard Cross began assigning each of his students the name of a fallen officer somewhere in the United States to research and report on. This class assignment continues to this day for all students in the Criminal Justice Academy so they will always understand the meaning of sacrifice and service to their communities. In 2011, the St. Petersburg Police Department lost three of their own officers, while serving their community, in the line of duty. In January, Officer Jeffrey Yaslowitz and Sgt. Thomas Baitinger and in February, Officer David Crawford. 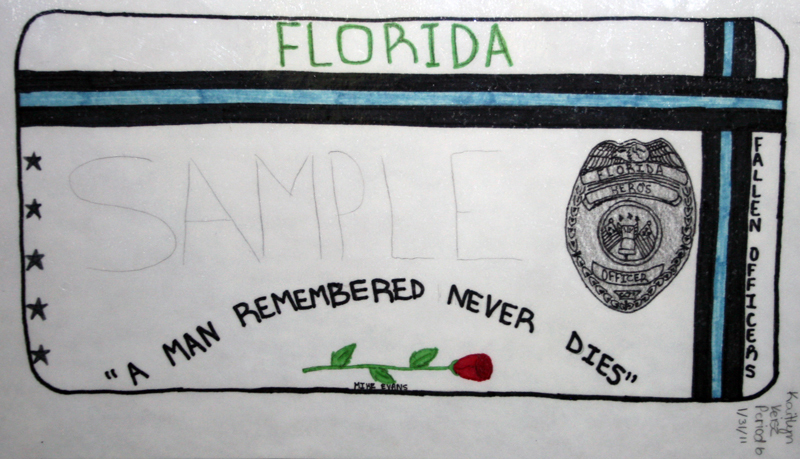 With the loss of these officers, Mr. Cross again went to his freshman students and this time assigned them to create a fallen officer memorial plate as the State of Florida had no such plate. Once these assignments were turned in, the freshman class selected the best plate to represent how they felt. As a follow-up to the plate assignment, Mr. Cross and his students began researching the process of how a specialty plate is created in Florida. During this process, the Police & Kids Foundation was asked to partner with them and be the charity that oversaw and managed the donations collected from the sale of the plate. For four years Mr. Cross, the Criminal Justice Academy Class of 2014 students, and the Police & Kids Foundation worked tirelessly pursuing the goal of having a fallen officer’s memorial plate for the State of Florida. In 2015 their hard work paid off and the Florida Legislators and Governor Scott passed and signed the “Fallen Law Enforcement Officers” specialty plate into law. As part of remembering how and why this plate was created, you will see the quote “A Hero Remembered Never Dies”. This was a quote spoken at the funeral of Deputy Williams. The three stars along the left side of the plate represent the three St. Petersburg police officers lost in 2011. We hope that this lasting tribute will reflect the sincere appreciation we have for all fallen heroes who have paid the ultimate sacrifice in order to keep us free. 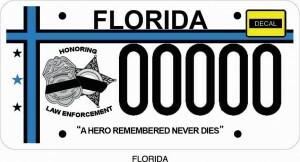 If you are interested in supporting our fallen law enforcement officers in Florida and their families please go to your local tag office and order your “Fallen Law Enforcement Officers” specialty plate. ALL proceeds from the sale of the plate go directly to the families of fallen law enforcement officers, and for specialized training / equipment used to protect our officers while they do their jobs. The Police & Kids Foundation Management Team and Advisory Board members are all unpaid volunteers and support our charity through the kindness of their hearts.